Activity: Show your child a photograph. Tell him about the occasion, when it was taken, who the people are, how they are feeling. 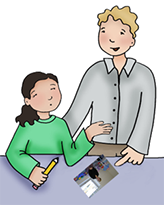 Allow your child to tell someone else about the photograph. Suggested Script: Look at this picture. This was taken the day you were born. This is your brother holding you. How do you think he was feeling? Other Activities: Ask your child to tell you about the picture. Write it out on a label and place it under the photograph.